Please be careful not to cut the tables or get glue on them. Familiarize yourself with the medium you are using, that is, cardboard. is weakest perpendicular to ridges. Take a piece of cardboard. Using the metal straight edge as a guide, cut the cardboard with a new blade. Do not use much pressure; Do not try to cut through the cardboard all at once. Try to cut just through one layer, without cutting other layers. Try to cut through just two layers, without cutting the third layer. Note how easily a sharp blade cuts the cardboard in just a few strokes. Think about which side of the cut is the good side and which side will be scrap. Put the metal guide over the good side so that if your knife slips, it will cut the side that will be scrapped. Create a clean, straight cut close to one of the edges. Make another clean, straight cut perpendicular to the first cut and close to the adjacent edge. Make sure that the corner made by these two cuts is perpendicular. Use the triangle to check that you have a right angle. Note: this step is necessary because the edges of a sheet of cardboard are often crushed. We want clean, straight edges. Note: Use only the metal straight edge when cutting the cardboard with the Exacto knife. Do not use the triangle as a straight edge: the sharp blade will ruin the edge of the triangle (unless you are using a metal triangle). Make sure to mark in two spots for each edge, to ensure that you 1make an accurate cut. Do not use a pencil to mark the cardboard; Use the Exacto blade which produces a more accurate mark. You will make three cuts into this square in order to make a clean joint at the edge of the cube. Think about which side of the cardboard you want to face out. From each chosen edge measure in 1/8" and lightly mark using the Exacto blade. Remove the first two layers from each of the three edges. Make a few light passes with the knife, until only the third layer is uncut. Do not cut all the way through the three layers of cardboard. You need to leave the paper so that it will cover the raw edge of the face that joins it. 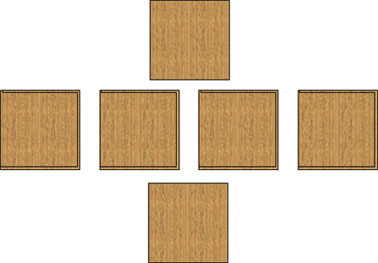 Remove the two layers of cardboard from the three edges. Repeat these steps three more times to make four sides to the cube. In particular, repeat the step of changing the blade each time you start a new side. On a fresh edge of your sheet of cardboard, cut a 3" square of cardboard for the top of your perfect cube. Repeat for the bottom face. Test the assembly of your cube. Assemble the sides so that you have shelf for the top and bottom faces and so the raw edges are all covered. Do a test assembly without glue to be sure you know how your cube goes together. Get a scrap piece of cardboard (aka a glue pad) and put a blob of glue on it. Use a small stick or your finger to transfer the glue from the pad to your part. Put a thin film of glue on the paper part of the joint. (You don't want to put it on the corrugated part - it will blob and not stick well.) Be sure you have just a thin film of glue and be sure that the glue is only on the joint, not running all over your cube. Hold the joint together for about 10 seconds before proceeding to the next joint. Most people find it easiest to assemble the sides around the bottom and to add the top as the last step. Be careful and pay attention -- both to your own limbs and to those of the people around you. Put the cork side of the straight edge down. Double check to be sure you are cutting over the board. Cut toward yourself. Cut slowly and carefully. Some people find it easier to cut standing up because the angle and pressure are better.